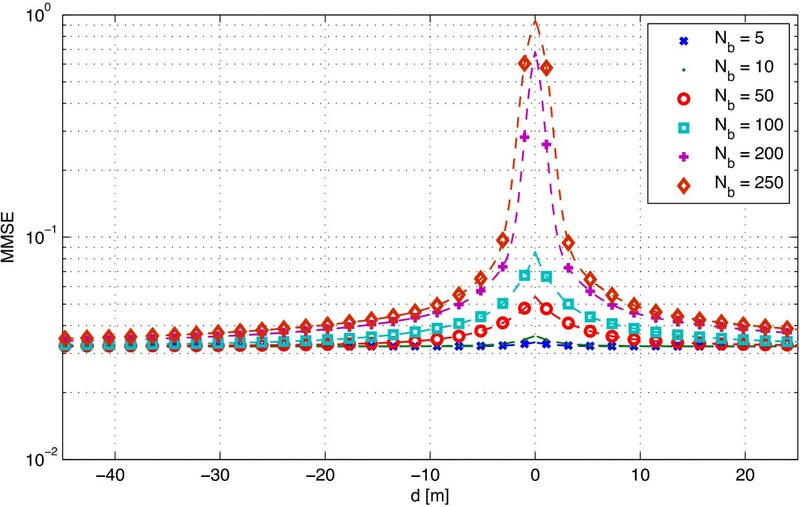 In this paper, we use a set of modulated discrete prolate spheroidal sequences (MDPSS) to represent a band-limited channel in the scenario with scattering from one or more clusters which can be used in both vehicle-to-infrastructure (V2I) or vehicle-to-vehicle (V2V) communication cases. Then we evaluate the performance of 2×1 space-time transmit diversity (STTD) system with Alamouti coding and imperfect channel estimation at the receiver. We consider examples of different scattering environments which represent vehicular communication in urban areas, derive expressions for autocorrelation function of channel gains and verify it by simulation. Scattering effect on estimation quality of the system is examined in terms of minimum mean square error (MMSE) and bit error rate (BER). High-quality channel state information (CSI) is essential for reliable performance of any practical communication system. The most popular approach is estimation via training sequences (pilots) which are periodically inserted into the data stream [1–3]. The receiver extracts pilot sequences and, relying on the knowledge of channel statistics, performs the estimation. For simulation purposes, Rayleigh fading channels with Jake’s spectrum  and real-valued auto-covariance function are usually assumed, for example in works [1–3, 5, 6]. This is the worst case scenario, since there is no preferable angle of arrival (AoA). Therefore, it leads to unnecessarily large amount of pilots needed for reliable estimation, which is inefficient. Moreover, practical channels usually exhibit non-symmetric spectrum and complex-valued auto-covariance functions. This work is focused on the estimation in a realistic urban environment. 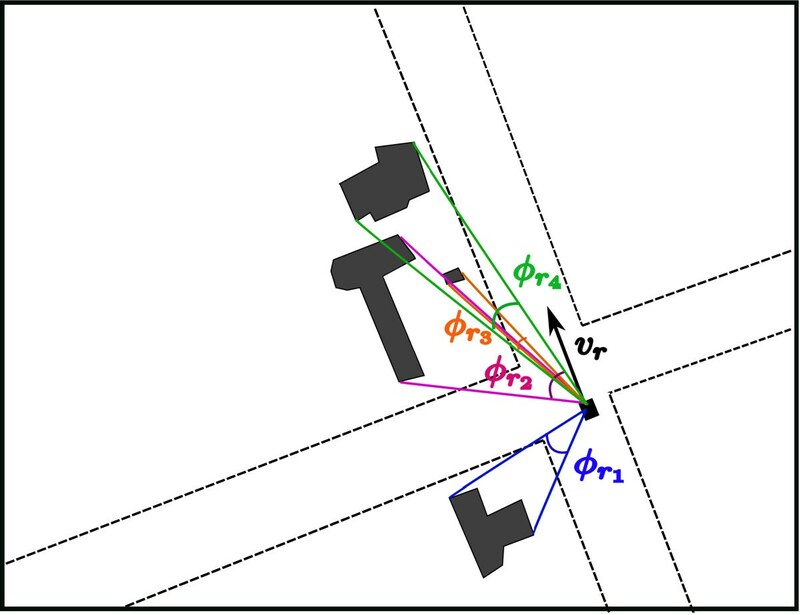 Hence, our goal is to account for a complex scenario, which describes scattering from one or more narrow clusters near the mobile, what results in the presence of diffusive components in received signal coming from particular AoA, and to provide qualitative analysis of estimation in different real-life scattering scenarios. Measurements show, that realistic spectrum could be represented as a sum of sub channels with a narrow and rectangular spectra [7, 8]. Therefore, we can assume that the signal spectrum can be approximated as a group of distinct rectangles (corresponding to different clusters) and not as a classical Jake’s bathtub shape. Such representation allows us to perform more practical analysis of communication link and obtain more sensible results of estimation quality. Channel basis expansion models (BEM) recently gained attention due to simplicity of their implementation . For example, some models describing Jake’s spectrum include complex-exponential BEM  or polynomial BEM . Discrete Karhunen-Loeve BEM is optimal in mean square error (MSE) sense [11, 12]. In this expansion, optimal set of basis functions depends on the spectrum shape. It was shown in [11, 13] that for a rectangular-shaped spectrum, a set of discrete prolate spheroidal sequences (DPSS) is optimal. Moreover, with the assumption that the spectrum can be approximated as an aggregate of rectangles, DPSS would provide a universal basis expansion. The channel model we use is described by a four-dimensional tensor of MDPSS representing channel response . 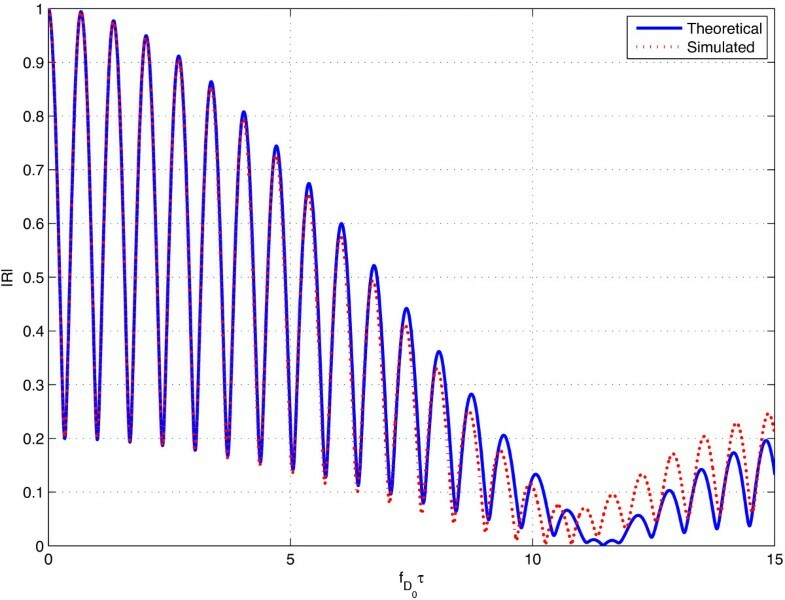 By modulation of the bandwidth of a set of DPSS, we achieve different scattering scenarios with parameters defined by theoretical models or/and measurements . V2V communication is accompanied by the movement of both receive and transmit sides with low elevation antennas and scatterers, which are assumed to be located on perimeters of multiple co-focal ellipses (with the receiver and the transmitter at ellipses’ foci). MDPSS channel model is a regular-shaped geometry-based stochastic model (RS-GBSM), which is very flexible in definition of the geometry and location of different clusters in Moderate Spatial Scale (MSS) or Small Spatial Scale (SSS) scenarios . Furthermore, this model is suitable for application in both V2I and V2V scenarios, as it gives us the control over definition of the motion of both communication sides. 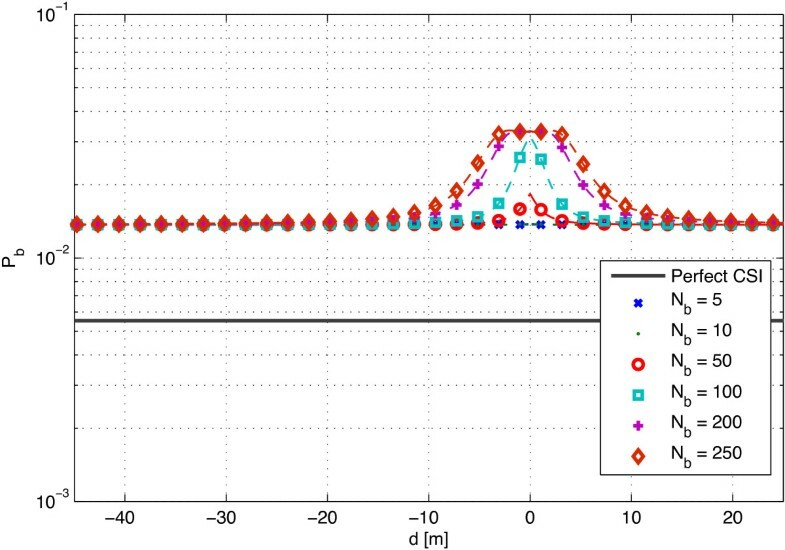 Thereafter, we evaluate how scattering from narrow clusters affects estimation quality of the mobile. These results could be further used in analysis and optimization of IP-level protocols, such as PMIPv6 . Multiple-input single-output (MISO) is a very common scenario in the downlink of a cellular system. Therefore, in our work, we focused on a simple yet elegant coding technique, the Alamouti scheme , which is used in some third/fourth generation wireless mobile standards. 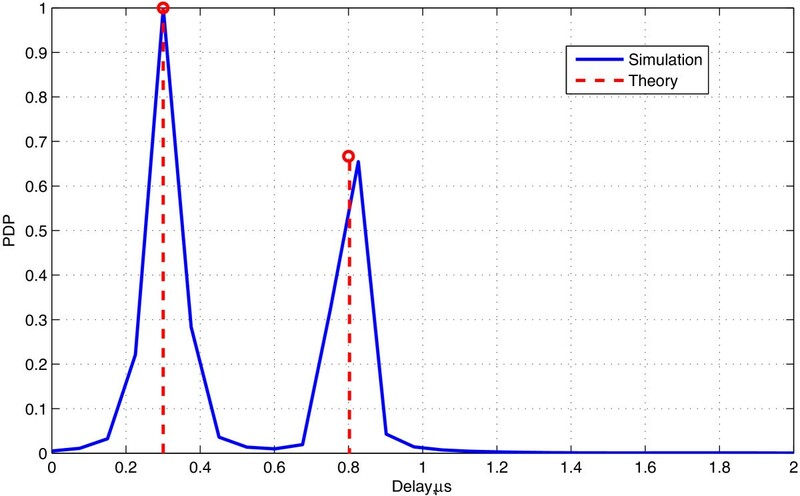 Pilot-assisted channel estimation is used with Wiener filter as a pilot filter . In IEEE 802.11p, V2x communication standard single-input single-output (SISO) systems are postulated, but multiple-input multiple-output (MIMO) systems and their variations could be employed to improve the reliability of communications. The remainder of our paper is organized as follows: in Section 2, the MDPSS-based channel model is reviewed and simulation results for one and two cluster case are presented. The 2×1 MISO communication system with Alamouti coding and channel estimation is described in Section 3. In Section 4, two different cases of environment were tested and the performance of the system was evaluated via MMSE and BER. Moreover, an example of simulation of the channel at a real intersection was shown, followed by analysis of communication link. The conclusion is in Section 5. Geometry of a single cluster problem. R tot ( τ ) = ∑ k = 1 N c P k exp j 2 π f D k τ sinc Δ f D k τ . 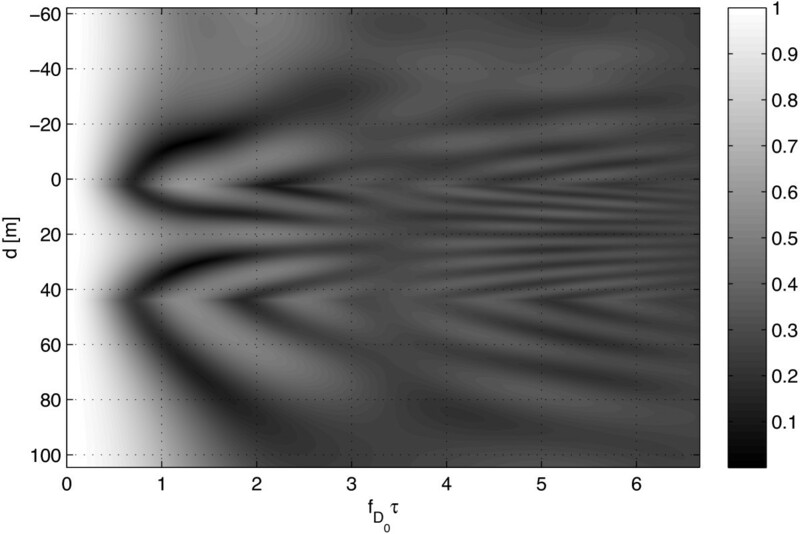 In this section, we present some results from simulation of a flat fading channel with one and two clusters and compare them to theoretical derivations, discussed previously. An example of parameter summary of a single cluster from Figure 1 is given in Table 1, and parameters of a two-cluster case, which is depicted in Figure 2, are given in Table 2. If some parameters are not mentioned in the second table, they remain the same as in Table 1 and equal for both clusters. Simulation results for the one-cluster scenario are given in Figures 3, 4, and 5. 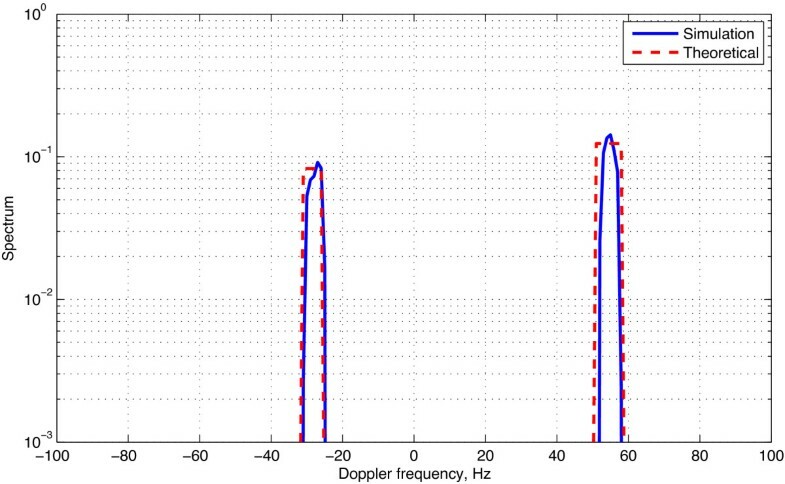 Power delay profile (PDP) of this case is given in Figure 3, where there is a clear peak at delay associated with a particular cluster τ=0.3 μ s with delay spread of Δ τ=0.1 μ s. At Figure 4, we may see power spectral density (PSD) with resulting widened Doppler spectrum around frequency f D ≈54.7 Hz with Doppler spread of Δ f D =4.8 Hz (calculated from Equations 1 and 2). The absolute value of auto-covariance function for this case, |R(τ)|, is given in Figure 5 as a function of normalized Doppler time f D 0 τ , where f D 0 = f c | v t | + | v r | c . In all figures, we can see a good correspondence between the theory and the simulation. 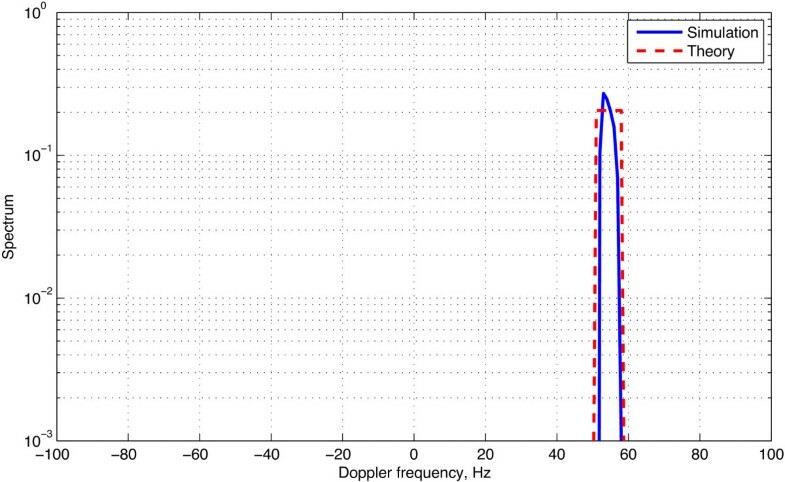 PDP of one-cluster channel response, τ = 0.3 μ s.
Doppler PSD of one-cluster channel response, f D ≈ 54 . 7 Hz. Envelope of the auto-covariance function of the channel process, | R ( τ )|. PDP and PSD of a two-cluster environment are shown in Figures 6 and 7, where we may observe a pick of received power at delays τ1=0.3μ s and τ2=0.8μ s with power delay spread of 0.1 μ s each (Figure 6) and widening of spectrum at fD 1≈55 Hz and fD 2≈−28 Hz (Figure 7), the same frequencies that one may calculate from Equation 1. 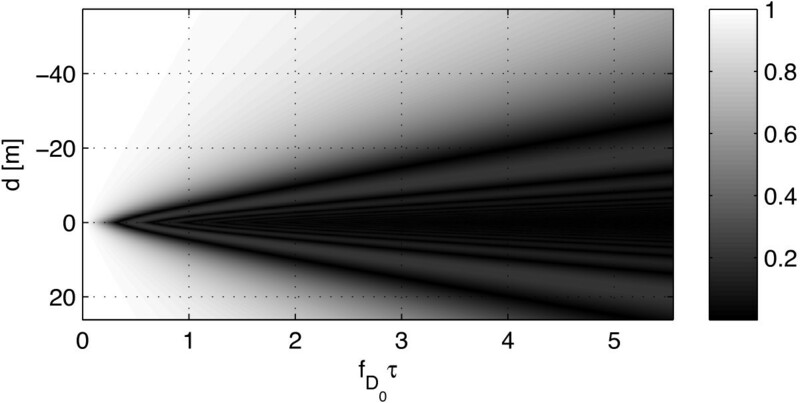 Theoretical and simulated envelopes of auto-covariance function are plotted in Figure 8. Again, there is a good agreement between simulation and theory. PDP of a two-cluster case, τ 1 = 0 . 3 μ s, τ 2 = 0 . 8 μ s.
Doppler PSD of two-cluster channel, f D 1 ≈ 55.7 Hz, f D 2 ≈ − 27.8 Hz. 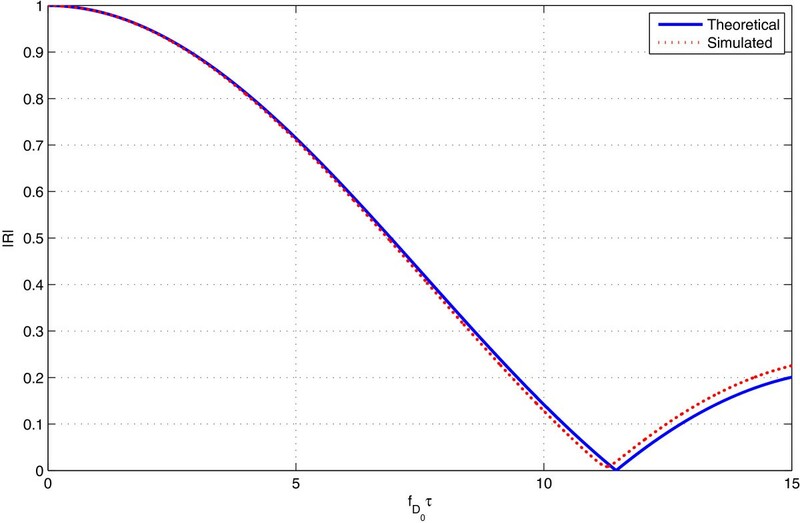 Envelope of auto-covariance function of two-cluster channel process, | R ( τ )|. It is also assumed that the channel remains constant over two symbol times: h1 =h1 =h1, h2 =h2 =h2 (the quasi-static channel assumption is valid when data rates are relatively high). Alamouti coding at time 1 (a) and time 2 (b). y 1 y 2 ∗ = h 1 h 2 h 2 ∗ − h 1 ∗ u 1 u 2 + ξ 1 ξ 2 ∗ = H u + ξ .
γ ̄ s is the average data signal-to-noise ratio (SNR) or E b /N0, when E b is the amplitude of the signal. r p j m = 1 2 h j m + ξ j m , r → p j m = r p j m − M ⋯ r p j m ⋯ r p j m + M T .
An example of a frame with 3 pilot signals, M = 1.
h e = 1 2 D 0 2 + γ ̄ p − 1 I 2 M + 1 − 1 ρ e .
D e ( k , l ) = R − eT s + ( k − l ) T s N b , k , l = 1 , … , 2 M + 1 ; e = 0 , … , 2 N b + 1 .
ĥ 1 m , e = h e H r p 1 m , ĥ 2 m , e = h e H r p 2 m .
Index m runs on frame slots with interval 2(N b +1)T s . It is worth mentioning that since we deal with Gaussian distributed channel gains, Wiener filter is an optimal estimation filter. P e = 0 = 1 4 2 + Υ 1 − Υ 2 .
ε 0 = ρ 0 H D 0 2 + γ ̄ p − 1 I 2 M + 1 − 1 ρ 0 , ε 1 = ρ 1 H D 0 2 + γ ̄ p − 1 I 2 M + 1 − 1 ρ 0 .
σ e 2 = 1 − ρ e H D 0 2 + γ ̄ p − 1 I 2 M + 1 − 1 ρ e .
In this section, we present some numerical results which evaluate the behaviour of the transmission system, discussed in the previous section, in terms of estimation MMSE and BER, and analyze the influence of realistic scattering on the estimation quality. Thus, for example, Figure 11 shows estimation error for different number of pilots M in a one-cluster environment. The simulation was performed for the rate of 50 Kbps, N b =5, e=0 and cluster parameters given in Table 1. As we would expect, the greater number of pilots reduces estimation error for any SNR. It happens because the larger number of pilots provides more information to the receiver about correlation of channel gains; therefore, better estimation is achieved. There is a good convergence between theory and simulation. 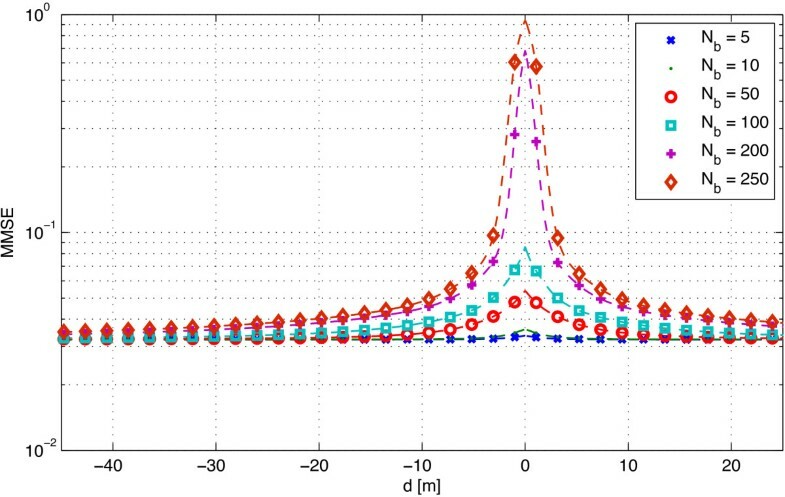 Estimation quality as a function of SNR and number of pilot signals M .
Assuming that the exact geometry description of clusters and obstacles is available through different accessible applications like Google Maps Ⓒ for 3D street view or through different global navigation and positioning satellite systems like GPS, GLONASS or QZSS, it is possible to model the geometry of any site of interest. Further, we present different scenarios of V2I and V2V cases. Δ ϕ r ( t ) = 2 tan − 1 a tan Δ ϕ r 0 2 a − 2 v r t · tan Δ ϕ r 0 2 . V2I scenario, a mobile is moving under a big road sign. Here, Δ ϕr 0=5°, ϕ r ≈0°. The width of the road sign a=5 m and all the other parameters are as in Table 1. Figure 13 shows behaviour of absolute value of auto-covariance function of channel gains as a function of Doppler time and a distance to the cluster. Negative distance implies that the mobile is located on the left side of the cluster (according to Figure 12) and positive distance implies that it is located to the right. Cluster is located at d=0 m. It can be seen, that, as the mobile gets closer to the cluster, auto-covariance function decays faster. As a consequence, the pilot signals become less correlated, which results into higher estimation error. 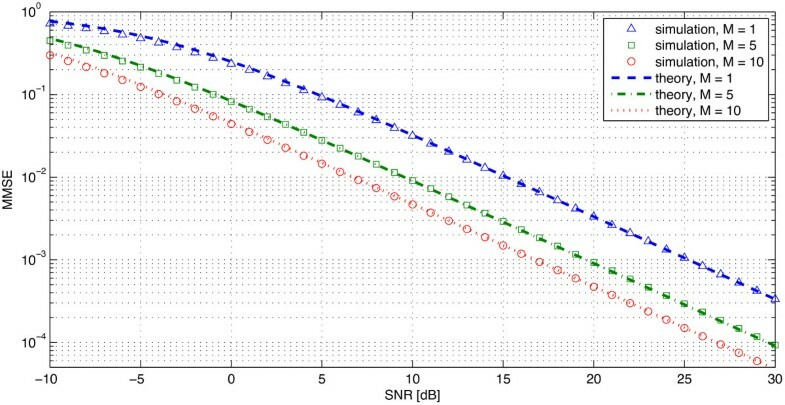 The behaviour of channel gains estimation MMSE as a function of distance to the cluster at S N R=10 dB and 50 Kbps rate with M=1 and e=0 for the estimation is shown in Figure 14 and the resulting BER is given in Figure 15. If we compare BER curves to Perfect CSI case (or error-free estimation), we may see the initial increase of 4 dB in BER, which happens because of the estimation based on three pilots only. It can be improved with use of more pilots (up to 10). Further increase in BER is introduced as the car nears the cluster. We may observe, that the effect of cluster’s presence is more pronounced at longer frames. If the frame is built of more than 100 blocks, MMSE increases dramatically when the vehicle approaches the cluster. For example, for 200 block frames, the increase in MMSE is more than 10 times with resultant increase in BER by 4.7 dB (see Figure 15), when the car is under the road sign. Therefore, this kind of clusters produce significant shadowing effect on communication session. On the other hand, this apparent decrease of communication quality is fleeting and does not last more than a couple of seconds (in a current setting). Absolute value of autocorrelation function of channel gains, | R d , f D 0 τ | , V2I scenario. Estimation MMSE as a function of distance to the cluster and frame length. At SNR =10 dB, 50 Kbps rate and three pilot-based estimation, V2I scenario. BER as a function of distance to the cluster. 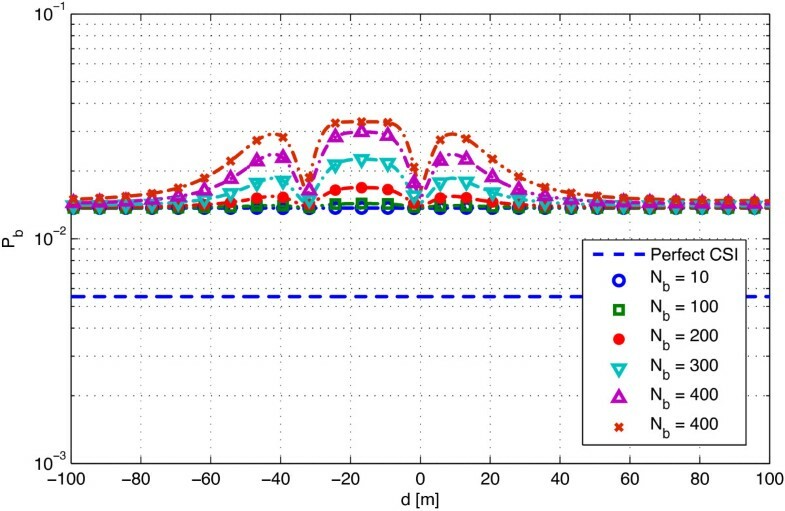 At SNR =10 dB, 50 Kbps rate and three pilot-based estimation, V2I scenario. ϕ r , t , i ( t ) = tan − 1 h tan ϕ r 0 , t 0 , i h − vt tan ϕ r 0 , t 0 , i , i = 1 , 2 . V2V scenario with two clusters. 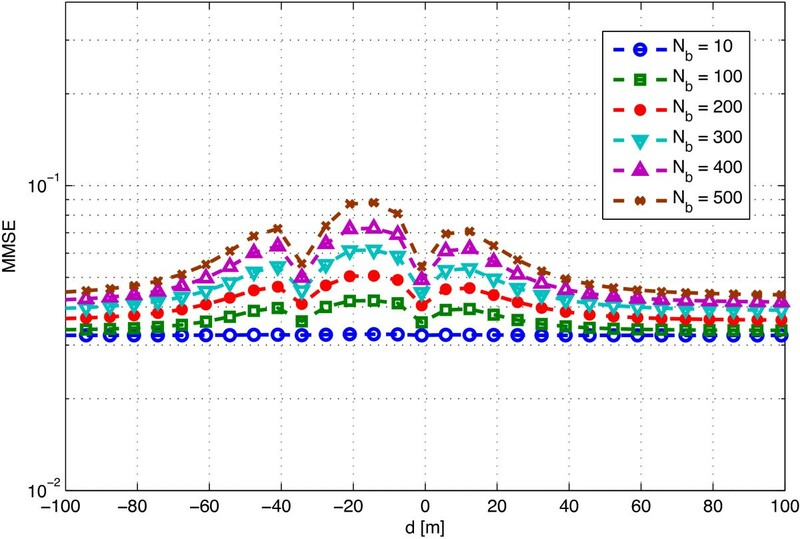 The snapshot of auto-covariance function in the case when both vehicles’ speeds equal 30 km/h is shown in Figure 17. Resulting estimation MMSE and BER are shown in Figures 18 and 19. Figure 18 shows estimation error as a function of frame length N b and the distance from the cluster with respect to the receiver. As we can see, longer frames increase MMSE due to decreasing correlation between pilots. 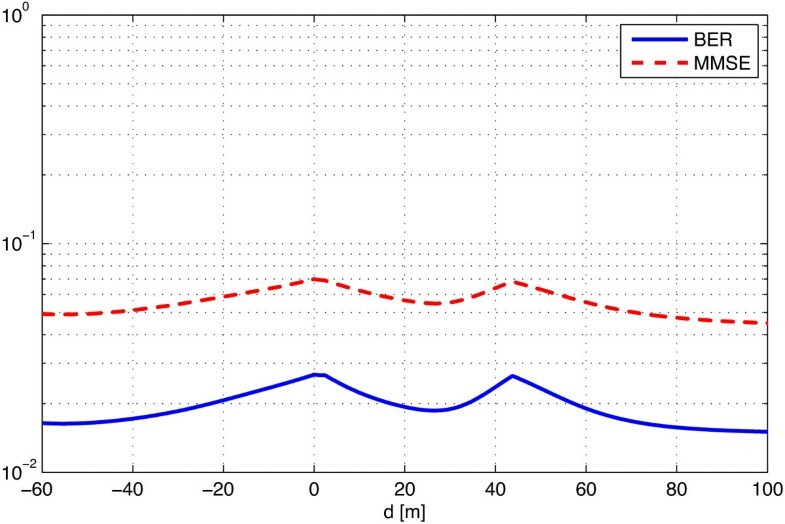 On the graph we can distinguish two notches at d=−40 m and d=0 m, where the system experiences quick decrease in estimation MMSE, corresponding to the vehicles’ location strictly perpendicular to clusters. This behaviour has a simple explanation: when one of the mobiles is located at the minimal distance to clusters, both clusters have equivalent angular parameters, what in terms of auto-covariance function equals to summation of two equally modulated sink functions; therefore, when absolute value is taken, it behaves like a one-cluster case: a slow decay in correlation as an absolute value of a pure sink function. Or effectively, the mobile ‘sees’ one cluster with unity power. The greatest estimation error is induced when vehicles are located at the different sides of the cluster (−40 m≤d≤0 m on the graph). From the graph of BER (Figure 19), we see that (as in V2I case), there is an initial recession of 4 dB in performance because of estimation based on three pilot signals, and further increase of 3.8 dB is introduced because of the cluster presence. In this scenario, the effect of clusters is not fleeting as in the previous case (V2I scenario) and starts affecting the communication quality, when the mobile is located as far as 80 m from the cluster. Absolute value of auto-covariance function of channel gains, | R d , f D 0 τ | , V2V scenario. 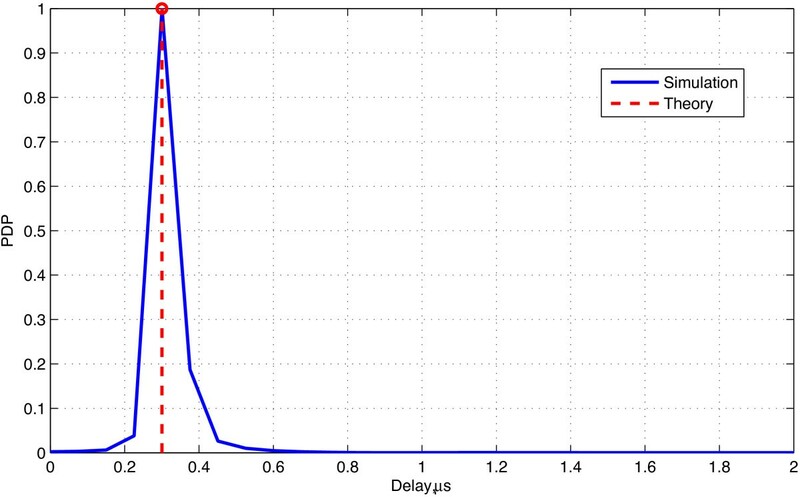 Estimation MMSE as a function of distance to the cluster. With respect to R x and a frame length N b at SNR =10 db and three pilot-based estimation, V2V scenario. BER as a function of distance to the cluster. With respect to R x and a frame length N b at the rate SNR =10 db and three pilot-based estimation, V2V scenario. In this section, we show how the channel model, discussed previously, can be used for simulation of a communication link at the real-life site, located at the intersection of Wonderland Road and Oxford Street at London, Ontario, Canada, as shown in Figure 20 (East of Wonderland Road view to the North-West). In this example, we used Google Maps Ⓒ application for measurements of distances and cluster dimensions due to its accessibility, but any other mapping and location application can be used for the similar analysis. Let us assume, that a mobile, equipped with the discussed communication system, is passing through the intersection with a speed of 30 km/h and moving to the North along Wonderland Road. Let us assume as well that there is a downlink between the mobile and a cellular tower located on the roof of one of the buildings on the left-hand side of the road, at the address 720 Wonderland Rd., which is approximately at the distance of 400 m to the North from the intersection, see Figure 21 (a view on the intersection at the Google Maps Ⓒ). 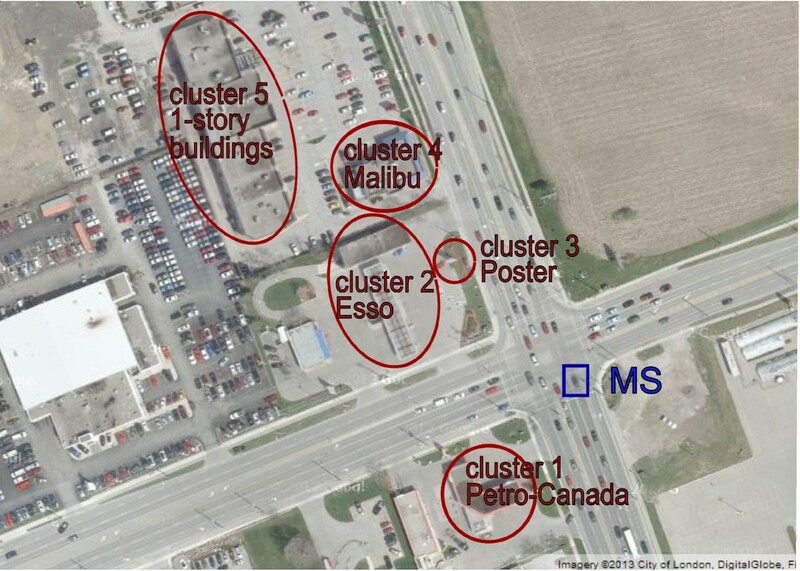 Analyzing the site, we may identify several clusters in the vicinity of the mobile: Petro-Canada and Esso gas stations on the Western side of Wonderland Road (and on opposite sides of Oxford), a big metal poster, a convenience store near the Esso gas station, and Malibu Restaurant West Inc. to the North from Esso, see Figure 22. All the rest of the buildings and obstacles are either shadowed by these four clusters (for example, cluster 5 at Figure 22) or too far to contribute to the signal scattering with respect to the current mobile location (but might be taken into consideration when recalculating the communication site layout as the mobile moves forward and approaches them). The distances, angles and angular spreads of each cluster can be easily measured and calculated using Google Distance Measurement Tool Ⓒ. The final cluster layout is shown in Figure 23, and parameters of each cluster are listed in Table 3. 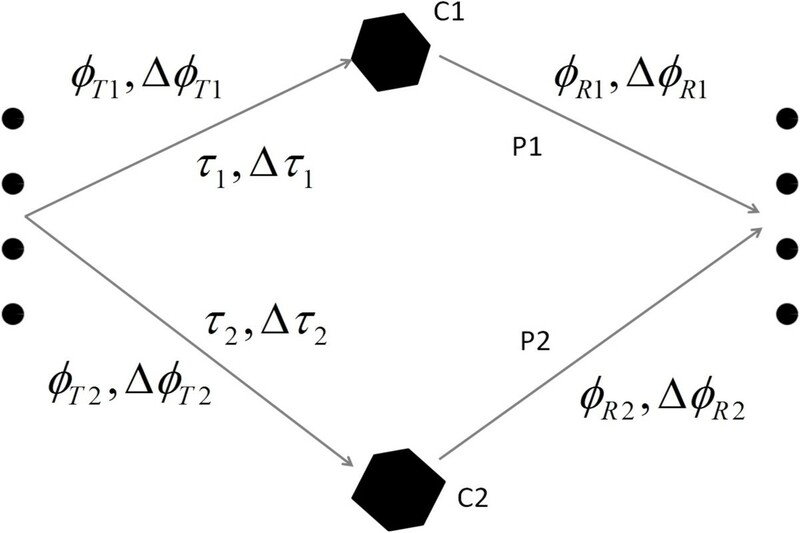 Powers of clusters were chosen arbitrary for simplicity purposes, but could be verified through more elaborate calculations, for example with use of Radar Equation . 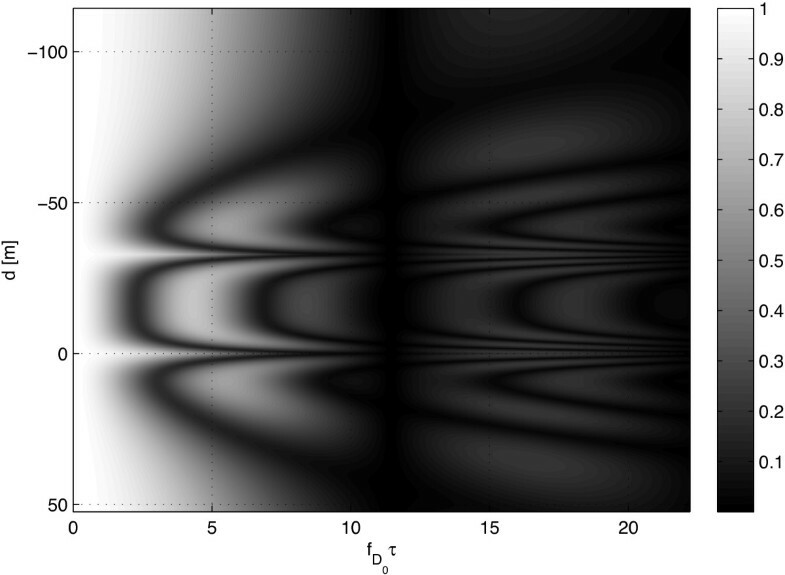 Auto-correlation function of the channel in this scenario is shown in Figure 24 as a function of normalized Doppler time and distance to cluster 2. As it is seen from the graph, cluster 1 almost does not contribute to the fading, cluster 2 and cluster 4 make the major contribution, and we may distinguish them on the auto-covariance function graph. Contribution of cluster 3 is merged with that of cluster 2, because this cluster is small and is located really close to the big cluster 2; therefore, the mobile is not able to differentiate between them. Effectively, it adds up to the power of cluster 2. Overall, the correlation snapshot appears blurred with a lot of grey levels corresponding to the correlation of 0.3 to 0.6 with no very pronounced dark areas (a very low correlation), as we saw in previous cases. The reason is that in this scenario, the distances between the mobile and clusters are bigger than in previous cases (30 to 64 m compared to 10 to 20 m) as well as angular spreads (25° to 35° compared to 10° to 19°). An example of MMSE and BER for 200 blocks frame-length and with three pilot signals prediction at 50 kbps is shown in Figure 25, where we can see the influence of clusters at 0 and around 40 m (with respect to the second cluster). Real Street View, Wonderland Rd. and Oxford St. intersection, London, Ontario, Canada, ON N6H. Google Map Street View Ⓒ , locations of base station and mobile station. Google Map Street View Ⓒ , clusters contributing to the signal scattering around the mobile. The geometry of the site around the mobile. 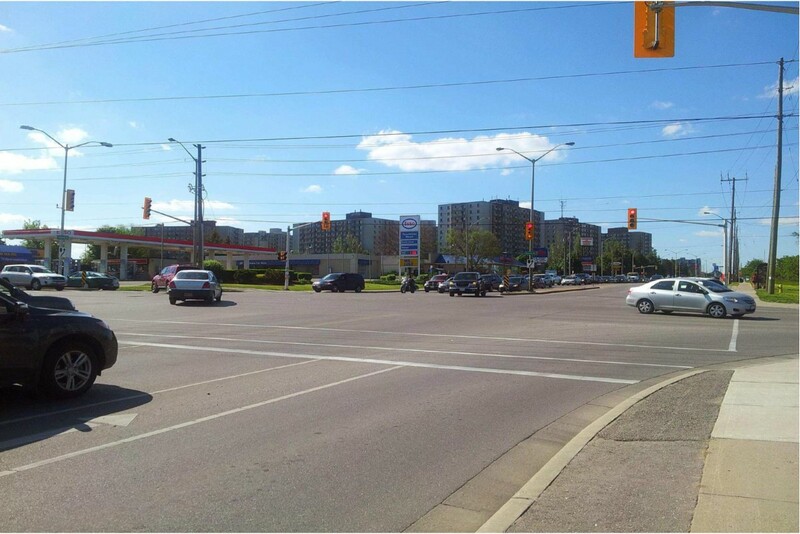 Auto-correlation function in a real-life scenario, Oxford Street - Wonderland Road intersection, London, ON, Canada. 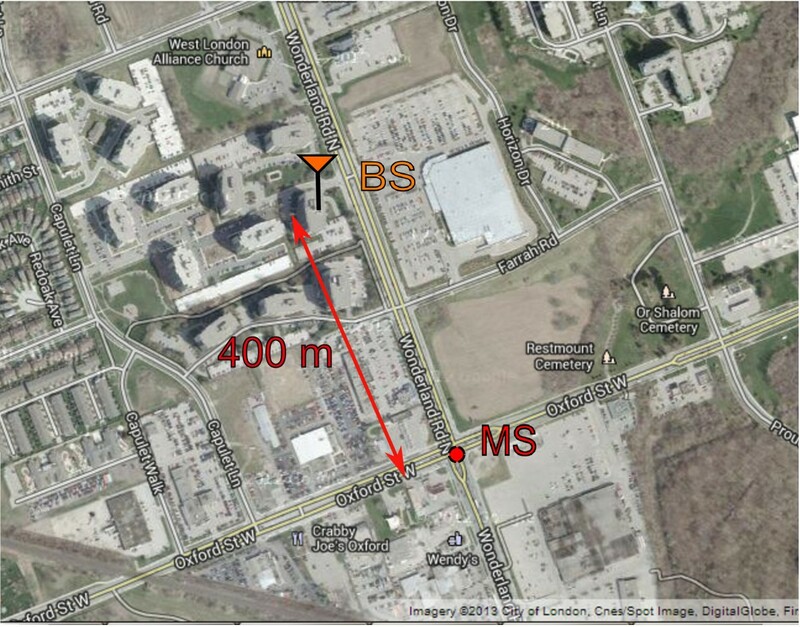 MMSE and BER as functions of distance to the cluster, Oxford Street - Wonderland Road intersection, London, ON, Canada. In a similar way, the communication in any type of terrain, containing multiple obstacles, can be analyzed. Of course, extension to more complicated scenarios describing bigger number of clusters with non-symmetrical allocation is straightforward. Also, another various kinds of modulation and transmission schemes could be evaluated to improve the overall performance of the system. In this paper, MDPSS-based channel model was adopted for representing a practical environment containing one or more clusters whose geometry is known and predefined. It mimics realistic channels with non-symmetric spectra and complex-valued auto-covariance function, what allowed us to obtain more reasonable results. STTD communication system with Alamouti coding and pilot-based channel estimation was described in detail and applied to two different realistic scenarios: one of them depicts V2I communication with a mobile moving under a big cluster located on the way of the mobile, like a road sign. The other one sketched V2V case with two similar clusters located on one side of the road and two communicating mobiles passing by. The analysis of estimation quality were performed for each scenario. In both cases, an increase in estimation MMSE was detected in the vicinity of clusters resulting in the degradation of system performance in terms of BER. The effect of performance downgrading is larger in cases of longer frames between pilot signals, as a straightforward result from quickly decaying auto-covariance function of channel gains in occurrence of clusters in the environment. In the first scenario, the increase in MMSE and BER was higher than in the second scenario, although with shorter duration. Finally, an example of implementation of aforementioned channel model in simulation of communication at a real-life intersection was presented and discussed. It is worth mentioning that due to flexibility of the MDPSS simulator, the description of a vast variety of different scenarios is available, allowing one to easily test any kind of environment with different positioning of clusters in both V2V and V2I cases. Elena Uchiteleva and Serguei Primak contributed equally to this work. The authors are supported by NSERC Canada.